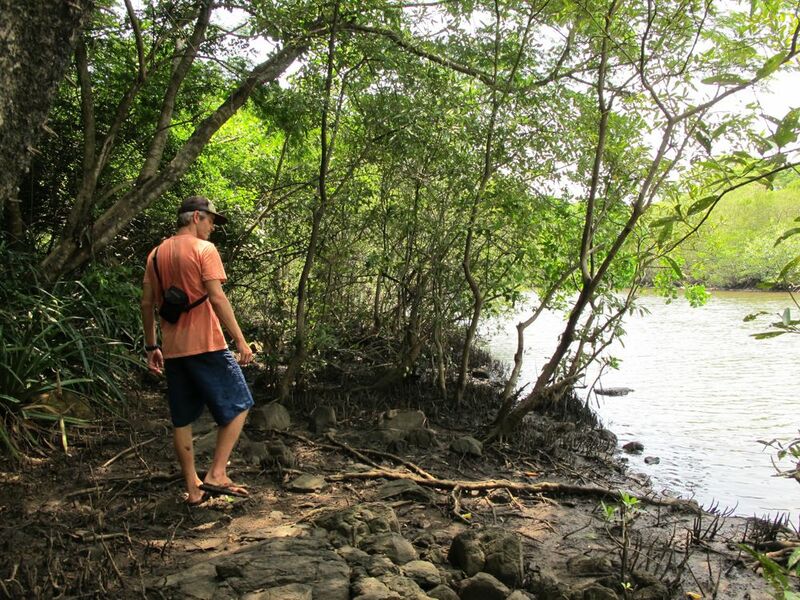 Building in Nicaragua – Is Cutting Mangroves ever Sustainable? 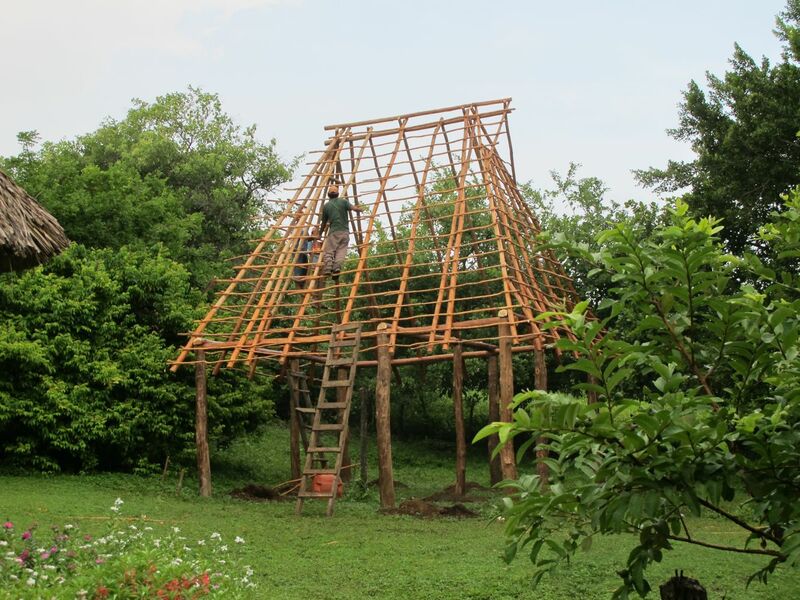 Varilla is the thin wood used to hold the thatch in place. 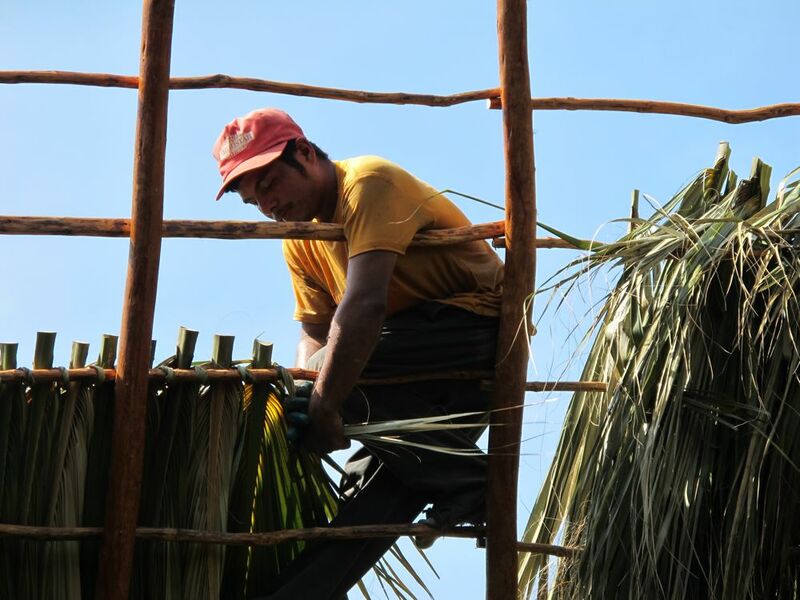 We were told we needed to get some varilla to support the palma (palm thatch leaves used for our roof). So we said “OK, where do we get that”? We could either buy it from a local guy or at the market for 30 Cordobas (cords; exchange rate = 22 cords/US$) per dozen. We’re trying to use local materials and labor wherever possible, so decided to order it from the local guy and were waiting for it the next morning. When it didn’t come we found out that the local guy’s son had been struck by lightning the week before while fishing in a boat at sea and he had forgotten to cut it. Understandable, but what do we do now? Our awesome construction foreman, Orlando, declined an offer for over-priced varilla from another local guy and decided to have our guys (building crew) get it on their own. The next morning we told Orlando that we wanted to go see the guys cutting it and where were they? 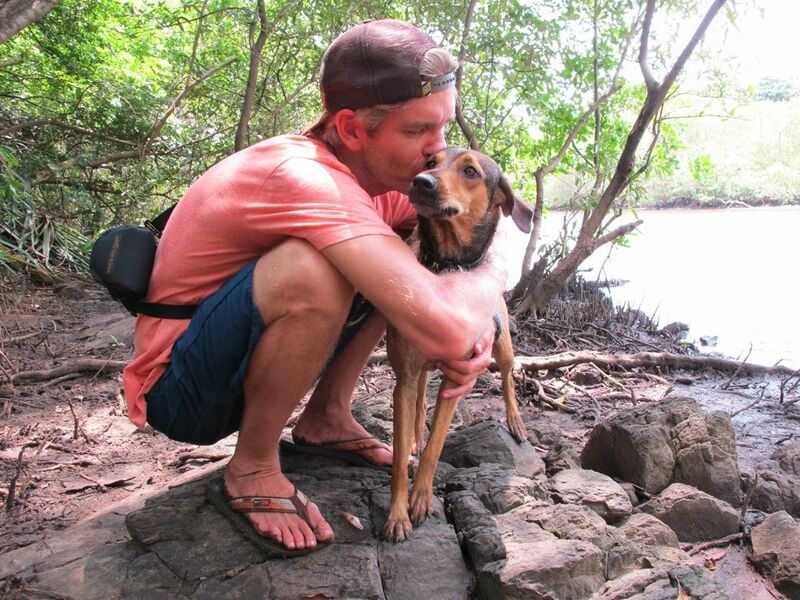 He responded “over near the estuary in Nahualapa Bay. Just go over there and you’ll hear them chopping”. The next step is installing the varilla. What type of wood is varilla? Is it a mangrove mangle (mangrove)? He explained to us that that varilla is not mangle, which is protected in Nicaragua, but garumo, a tree which could legally be cut. So, off we set to find the varilla-choppers. We assumed we would find them on the forested hills next to the estuary. After stomping around the hills for over an hour and not hearing any chopping sounds, we figured we wouldn’t find them. We decided to give it one more chance and actually walk along the estuary channel. Ardilla loves the estuary and mangroves! At low tide it’s easy to walk up the estuary and we hadn’t gone far when we saw a bundle of thin, straight sticks lying under a mangrove tree. Ah-ha, that must be from the varilla-choppers! Hmm, interesting- they are actually IN the mangrove forest, cutting varilla. In a moment, our guys emerged from the mangrove forest trail each carrying another bundle of sticks. We asked them again, “is varilla a mangle”? No, they said, its garumo. We asked them to show us this garumo tree and they pointed to a nearby mangrove. OK? Now, show us mangle, and they pointed to another, different species of mangrove. So, it turned out that the term mangle is reserved for one type of mangrove tree with broad leaves and long stilt roots. Garuma is another mangrove with smaller, thinner leaves and short pneumatophores (roots that come up through the estuary mud to get oxygen). They had already cut all the varilla that was needed and we went into the mangrove forest to see how it had been done. It was hard at first to see where they had cut but gradually we saw a stem cut here and there in the dense forest. 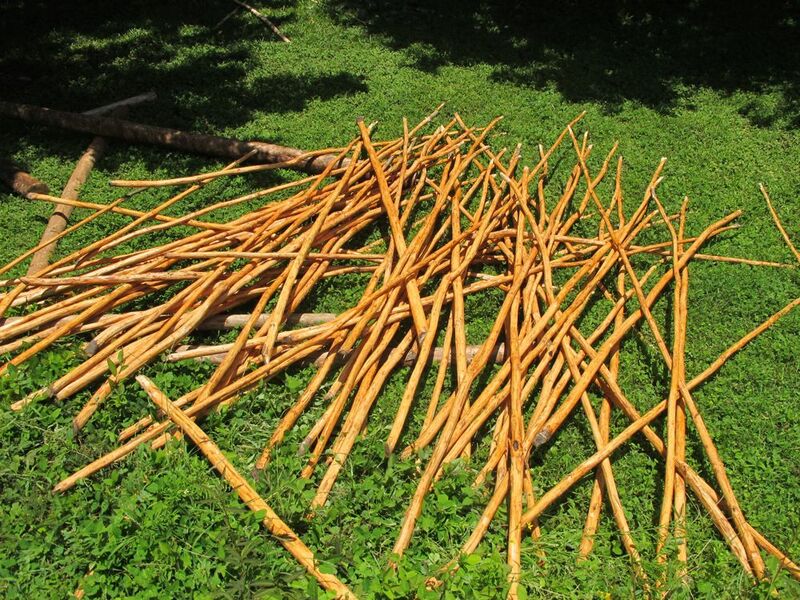 The stems were about 2” in diameter, saplings, and they had not cut a big swath of them down like a clear-cut, but had moved throughout the forest cutting in a more selective harvest-type method. That made us feel a bit better, like potentially this was a sustainable practice, but honestly we don’t know. We don’t want to be cutting mangroves even if it is legal here. 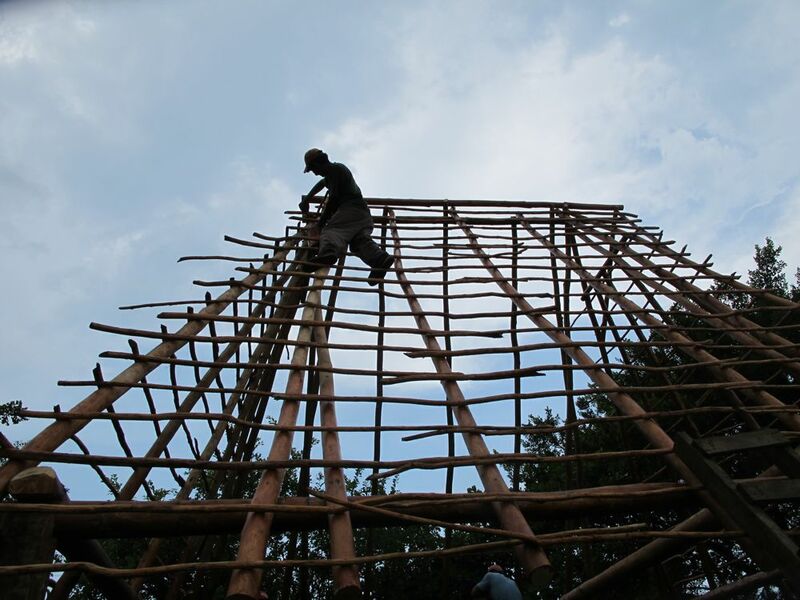 It also made us realize even more that we really, really want to use bamboo for our next building project. We need bamboo!!! 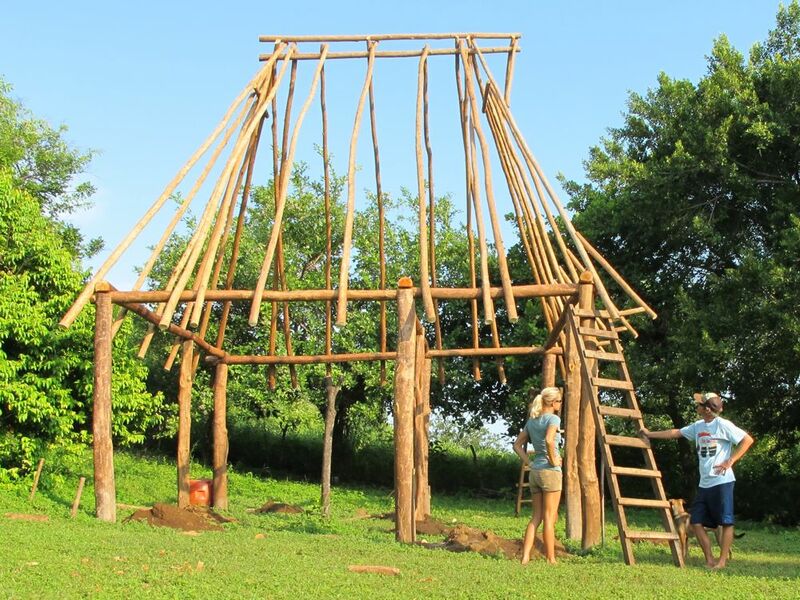 This entry was posted in Green Building and Bamboo, Nicaragua and tagged building in nicaragua, cabana, eco friendly, hipehabitat, holly beck, kim obermeyer, mangle, mangroves, northern nicaragua, thatch roof, varilla. Bookmark the permalink.